She gets hold of her camera and checks the battery; it’s not fully charged. She thinks to herself, for the job I have it should be fully charged, most probably I won’t have access to any electricity. It might be my last day of filming, she thought; because former Iraqi Prime Minister Nouri Maliki threatened he would attack Ashraf, home to more than 3000 Iranian dissidents, members of Iranian opposition. Early next morning, she gets up and waters the little garden in front of her room. She then asks one of her roommates to water the garden every day to keep it always green in case any thing happened to her. Saba’s roommate gives her a concerned stare, but Saba smiles and passes by her roommate. Good fate didn’t last too long; it faded as she remembered the horrific hours of the Iraqi forces’ last attack back in July 2009 when her friends were brutally shot to death and murdered. Iraqi forces started taking direct aimed shots; there is no place to take cover. She is capturing the scenes with her camera as she heard a cry:”Asiyeh” has been shot. Saba just cannot believe it. Asiyeh is her best friend and colleague. As she was recovering from the shock of this news about Asiyeh, another voice shouted in her ears: “Watch out Saba, Iraqi forces are shooting at any camera at sight, you are their target.” She rushes to Asiyeh to check up on her, but Asiyeh points at her camera which laid on the ground and tells Saba with her last breaths: “I caught all the scenes, pick up my camera!” Saba’s eyes get wet in tears. A vehicle approaches to evacuate Asiyeh for medical care. 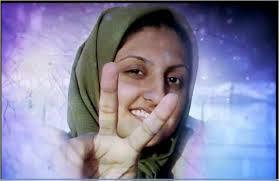 (Asiyeh was another eyewitness reporter who was shot to death on April 8, 2011). As Asiyeh was evacuated, Saba continues on filming the atrocities. One of the Iraqi soldiers, in charge of killing innocent people, unrelentingly aims and shoots. With each shot, one resident falls. He knew residents don’t have any weapons to defend themselves. A voice cried out: “Saba watch out, he is coming your way!” Saba starts running to take cover. A few seconds later she starts filming the armed men who are shooting at them. As she was filming she was thinking to herself, what do they want from us? Where in the world are asylum seekers slaughtered by official forces of the host state? This is another mystery of our times… Just then she felt severe pain in her leg and fell to the ground. Saba feels better after blood injection. Everybody is working hard to dispatch Saba to a hospital out of Ashraf, but the Iraqi forces are not permitting anyone exit the camp; since the residents are under a siege, no one, not even the wounded and sick are allowed to leave. In the ambulance she noticed her father is accompanying her, feeling a sense of confidence in his presence. After waiting for long hours inside the ambulance the Iraqi forces eventually allowed them to head off. When they reached the hospital Saba felt dizzy again and was in need of immediate blood injection. As she was fainting she could hear voices around her in Arabic. She came to understand that they said only in one condition would they provide the needed blood: only if her father would surrender to mullahs’ regime in Tehran. Saba realized that she and her father had to make a choice between human dignity and the cause of freedom of Iranian people, or treason and hypocrisy. As she willingly gave up her confortable life back in Europe and chose to make the ultimate sacrifice so that every Iranian youth would have a happy and free life, deep down she preferred that her father would not give in. The photo above is the last picture taken by Saba from the soldier shooting at her. She was wounded in this scene, on April 8, 2011 in an attack by Nouri Al-Maliki forces at Ashraf and died in a Baghdad hospital a few hours later. 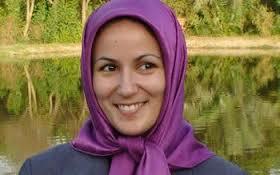 She was a member of the People’s Mojahedin Organization of Iran, the main Iranian opposition against the mullahs’ ruling Tehran. Her name will be remembered forever amongst devoted journalists who documenting atrocities with the objective of bringing all perpetrators to justice. Next Next post: Iran: If only Machiavelli were alive!